Zion Swedish Evangelical Lutheran Church – the name is a real tongue twister, especially considering that its founders’ native tongue was Swedish. The congregation was formed in 1891, breaking off from Grace Lutheran church a block to the west. The differences were not religious – both churches were members of the Augustana Synod. But the Grace church used English in their services, while Zion would conduct its liturgy in Swedish. Many Swedes, both professionals and laborers, were immigrating to western Illinois, and especially to Rock Island in the last quarter of the 19th Century. Augustana College, just a few blocks to the west, had moved here in 1875 and was an important influence for this synod. The college maintained a strong connection to Sweden and indeed many of its professors were Swedish. Right away, the newly formed congregation built a small church called “Svenska Kapell” or Swedish Chapel. It is visible at the far right of our postcard. Fifteen years later, the congregation commissioned prominent local architect Olof Cervin (who was of Swedish descent) to design a new edifice. The cornerstone was laid in April of 1907, and only seven months later, the new $18,000 church was completed. Although the formal dedication wasn’t held until the following spring, no time was wasted in occupying the new building. On the first Sunday in November 1907, the congregation bid farewell to their old chapel and marched in procession to their new church. News articles noted that a special song service was scheduled for the subsequent Sunday for those who could not understand Swedish but had contributed to the church building fund. Cervin’s church was simple yet elegant. Our postcard shows Zion shortly after it was completed and before the old Svenska Kapel had been demolished. The belltower, which dominates the façade, is trimmed with heavy crenellations framing the base of the steeple. While the flattened points of the windows and the mini adaptations of flying buttresses are a Gothic inspiration, the timbered gable and the bracketed gable porch show a strong Arts and Crafts influence. Even the small triangular dormers in the roof carry out the Arts and Crafts theme. By 1928, immigration from Sweden had diminished greatly and the children of the original immigrants were fluent in English. It was time for the English and Swedish congregations to reunite in a single church. 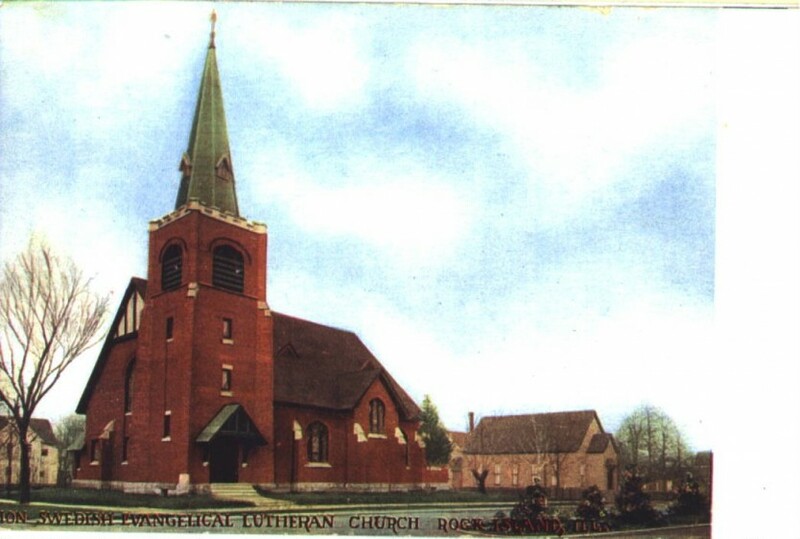 That combined church was named St. John’s Lutheran Church, the name we recognize today. The old Grace Lutheran church still stands a block west, now occupied by another denomination. Today, the church is nearly identical to the nearly century old postcard, which makes it even more special and rare. Its simple elegance has endured nearly a century, unfettered by fake stone or cropped steeple. The only change to the original building we observe are the missing small gables on the steeple. There is a large parish hall addition, which was built after the 1928 merger. Despite the size of the hall, it is properly located at the rear of the church. The brickwork and the gable design of the addition nicely complement the original church building. In 2001, the congregation undertook an extensive renovation. After nearly 100 years in place, the stained and painted glass windows were removed for restoration and then replaced to illuminate the redecorated interior. A new organ was also installed. The church has been a “key” partner in the success of its surrounding Keystone Neighborhood. The Keystone name was revived a decade ago, based on a turn of the century brochure touting the benefits of this area, which was originally planned as a link or keystone between the then widely spaced cities of Rock Island and Moline. This article by Diane Oestreich is slightly modified from the original, which appeared in the Rock Island Argus and Moline Dispatch on May 26, 2002.